DSMC completed the design, integration and testing of the i-Zen Intelligent Zero ENergy Flow Meter. 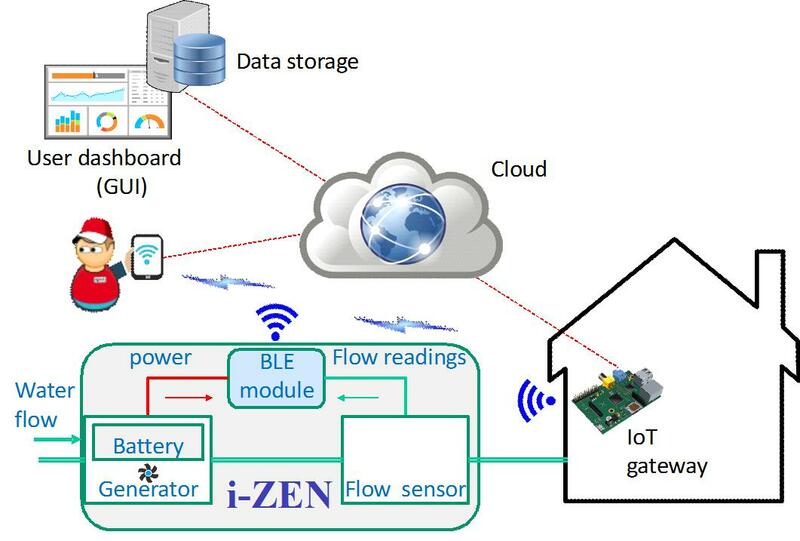 i-Zen is an Intelligent zero (externally provided) energy integrated flow meter device for the Internet of Things (IoT) featuring fully energy autonomous operation exploiting turbine based energy harvesting (prototype based on the DB-368 ZhongJiang Micro-Hydro generator and YF-S201 flow meter). It exploits a low power controller & communications module (Nordic nRF51822 based on an ARM Cortex M0) and its HW design has been optimized for power consumption, accompanied by an application to exploit the collected data (https://thingspeak.com/channels/396539/). Experimental data show that the device can operate practically for unlimited time. i-Zen flow meter is a product commercially exploited by the student enterprise of the Pierce Lyceum – American College of Greece (https://www.izen.gr) and presented in the «12th Trade Fair Athens 2018» organized by the Junior Achievement Greece. It has been developed in collaboration with Dr. Pariotis Efthimios (Assistant Professor of Hellenic Naval Academy), Dr. Theofanis Orphanoudakis (Assistant Professor of Hellenic Open University, Director of DSMC) and Anastasios Fanariotis (Research Associate of DSMC).